I ran ten miles this morning. Yep, ten miles. Crazy I know. It’s the furthest I’ve run since last year’s Great North Run, and having been a bit injured recently, I was a little bit cautious setting off to cover such a long distance. The last two weeks, I’ve wanted to fit in some super long runs as part of my prep for this year’s GNR (it’s four weeks today, bloody hell), but I’ve been having real problems with my calves and ankles – the woes of being an overpronator. The last couple of weeks, I’ve been taking it easy, only doing short runs and keeping the pace right down just to try and get some miles in. To my absolute shock and surprise, ten miles this morning, was an absolute breeze. Nearly up to normal race pace all the way round, and no mid-run stretching out required. It felt amazing to be back on track and hopefully this stands me in good stead to do another sub-2 hour half marathon. As with all long training runs, all I could think about was what delicious foodie treat I was going to have when I came back in. 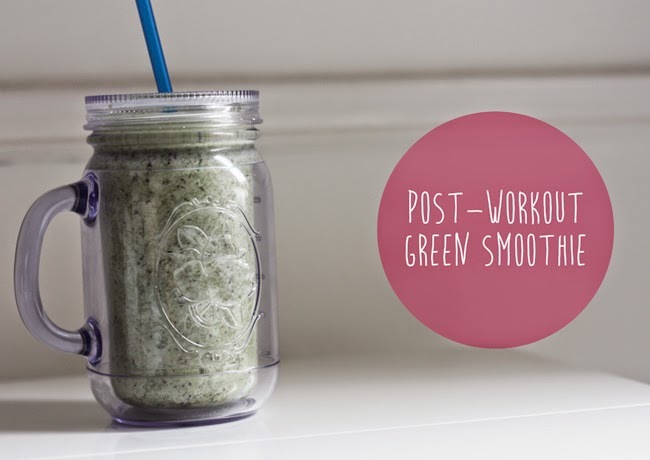 Along with a Quest bar (the only bar for getting a high-protein hit post-workout), I whipped up this super easy green smoothie. 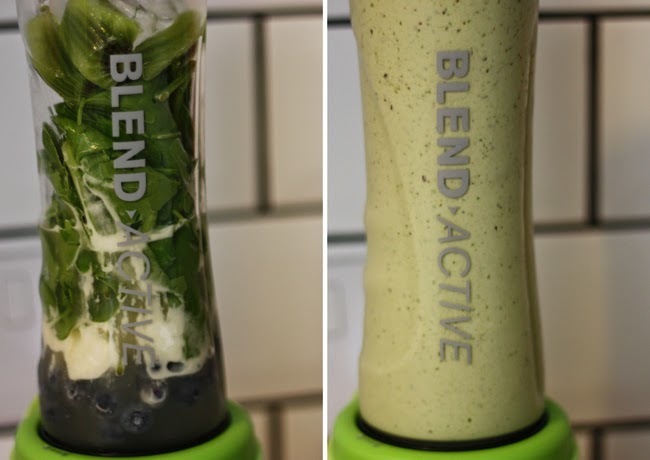 Smoothies are literally one of the easiest/quickest things to make and it took actual seconds in my new love, the Blend Active. Obviously, you can switch up these ingredients depending on what you prefer, but this is a pretty damn good combination. I feel a bit of fraud putting a step-by-step guide here as it’s literally just a chuck-it-all-in-a-blender kinda recipe. So go ahead, whizz away. What’s your favourite post-workout protein hit?